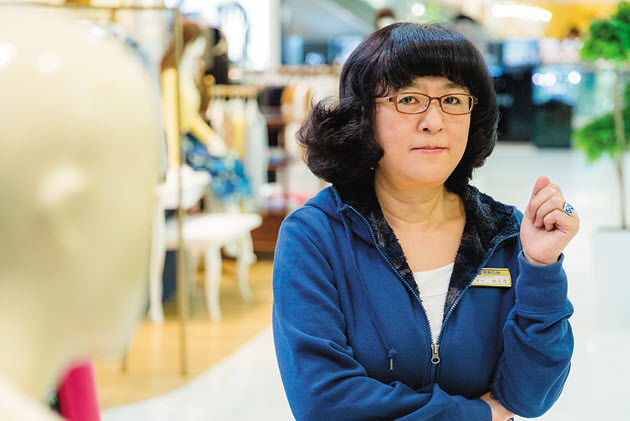 Lin Chih-chien, a department store counter sales lady, feels that her rights would be better protected with more government inspections. I have been a department store “counter lady” for over 20 years. In this line of work, you do not draw a set salary; rather you get a base salary plus commissions. The barrier to entry is low, not demanding professional skills or high educational achievement; as long as you work hard at serving your key customers, when business is good and your monthly earnings are high, you can derive a strong sense of accomplishment. However, the base salary has been unchanged for the last 20 or 30 years, while more and more department stores have opened, diluting the clientele. As a result, our commissions have declined as too many people are taking pieces from the same pie, making it hard to make a living in this trade. The Department of Labor only informed business operators to attend classes on how to set up a company structure, but they should have asked labor to go as well, to explain to us whether the conditions the boss set for us were legal. We never used to understand anything about labor codes. We never even had chairs at our counters, so I stood for 11 or 12 hours at a time, as a result developing bunions as well as varicose veins in my lower legs. Last year, Taipei City conducted an inspection of general work conditions, and after the media covered it, we got chairs to sit on. Only then did I gain an appreciation for what the Occupational Safety and Hygiene Act really meant. After the new work rules to standardize a five-day work week came into effect, I was not sure if it would result in more overtime pay; I simply had to wait until payday, and then go over my shift list and wage slips at the Department of Labor. We in the service industry rarely get Saturday or Sunday off, since customers come out to shop on weekends. We all get a few days off each month, but then we make up the hours with extra days on duty. In the past, my schedule was described as “six off, six compensated.” What that means is that there would be six scheduled days off per month, but you had to make up all the hours missed over those six days, and the company gave no dispensation for overtime pay. Starting this January, the company is letting us go to an “eight off, seven compensated” arrangement, whereby eight days off are set per month, but I only get one day’s part-time pay to hire someone to cover for me. And you still have to make up the work hours for the other seven days, so it is the same as only getting one set day off per month, and still barely getting any hours off in reality. Effective this year, wages for “special leave days”[annual leave] that are not taken must be paid on a prorated basis, so at the beginning of the year our company told us to schedule all our special leave days for the year, and make sure to use two-thirds of them by June. In the past we had a colleague cover for us on special leave days, and would have to make up the hours on our own. What staff member interested in keeping her job would have the guts to sue the boss? This year, at first the company said the old system of shift substitutions for special leave time will remain in effect. However, after I attended a class on the Labor Act and communicated to the higher ups that this practice goes against regulations, the company agreed to allow us to have part-time staff cover our shifts during special leave days. Counter ladies could find it difficult to change professions at this juncture. Many of us are getting older, and have worked in this field for 20 to 30 years. What staff member interested in keeping her job would have the guts to sue the boss? So I fear the best way to safeguard the labor rights and privileges of department store counter ladies is for the government to conduct more inspections of working conditions.